My editor/publisher/good friend Matthew Lore at The Experiment tipped me off to this lasagna from The San Francisco Chronicle Cookbook, Volume II, by Chronicle writer Tara Duggan. Only recently did I get around to making it, and wow, I really shouldn’t have waited so long because it is right up my alley. I love everything about California cuisine, but especially that of the Bay Area. Flipping through these Chronicle cookbooks—the first volume came out in 1997, and the second one in 2001, and it appears the latter is now out of print—as well as staying abreast of all of Heidi Swanson’s food adventures, really dramatizes how different the food of the Northeast is from the West coast. There’s such inventive vegetable love out there! When I first read the title of the recipe, I immediately felt satiated: lentils and squash together, a combo I’ve enjoyed in other contexts, along with sweet caramelized onions, a rich béchamel sauce, and a slight dusting of Parmesan. It sounded so unique, so hearty—and so simple! And while sure, it’s simple, it’s not exactly easy. Okay, it’s kind of a lot of work—about a 2-hour job before it even goes into the oven, and you’ll probably dirty every pot you own. There’s the squash that needs roasting, lentils that need simmering, onions that need caramelizing, milk that needs steeping, and béchamel that needs . . . béchamel-ing. Deeply caramelized onions are very important here—their sweetness amps up that of the squash, and if the onions are only partially caramelized, the finished lasagna just won’t realize itself. And on that note, what I know about caramelized onions is that you can’t rush them. The flame shouldn’t be any higher than medium, ideally medium-low; if they begin to burn, turn it down. Watch closely, stir periodically, and taste often. I’ve caramelized onions that have taken me an hour and a half, and I didn’t end up regretting a second of it. But after all that prep, assembly is a breeze. If you’re a kitchen hermit like me, you won’t mind at all, but even for those who aren’t: dirty dishes will be something to scoff at after you get a taste of this. I tweaked the recipe, primarily to scale it down for a 9 x 13 pan—the original is intended for a proper lasagna pan, which would give me more leftovers than I’d know what to do with. I’ve also substituted French green lentils (sometimes labeled as “Lentils du Puy”) with black beluga lentils, and butternut squash with a combination of butternut and 2 small acorn squashes. I’ll bet that kobucha would be great here, and next time I try it, I might also find a way to add some greens, like spinach, chard, or kale. 2. 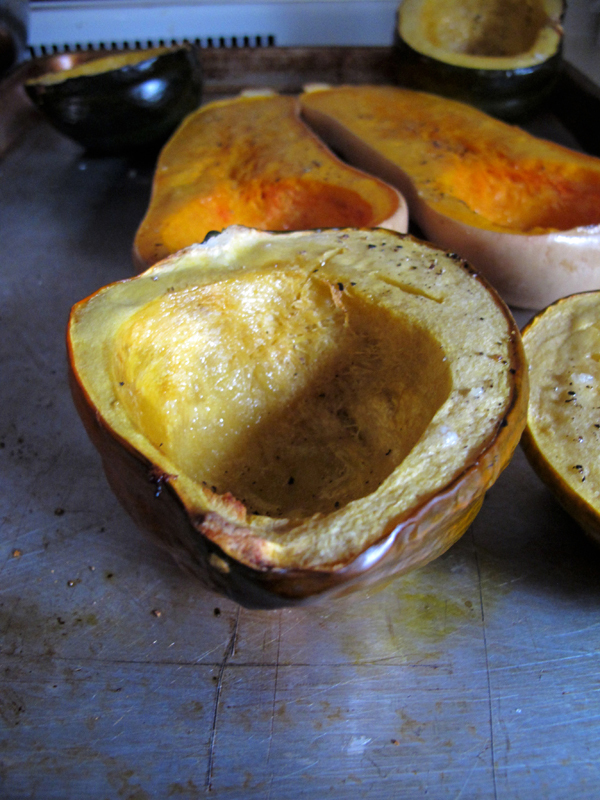 Roast the squash: Halve the squash and scoop out the seeds. Rub the flesh with 1 tablespoon olive oil. Arrange on a baking sheet and sprinkle with salt and pepper. Roast for 30 to 45 minutes, until the flesh is tender and can be pierced with a knife. Allow to cool until safe to handle, then scoop out the flesh or trim off the skin with a paring knife. Cut the squash into small, 1/2 to 1-inch pieces and place them in a large mixing bowl. 3. Reduce oven temperature to 350°. 4. Meanwhile, caramelize the onions: Halve 2 of the onions lengthwise and pull off the peel. Place on the cutting board, flat side down, and slice into thin half-rings. Heat remaining 2 tablespoons oil in deep skillet or sauté pan over medium heat. Add onions and cook, stirring frequently, lowering the heat if they begin to burn, until completely collapsed and pale golden-brown in color, 30 minutes and up to an hour or more. They’ll will melt in your mouth and taste entirely sweet, not the least bit raw or bitter. Stir in the garlic and thyme and cook for 1 or 2 minutes more, until fragrant. Transfer to the bowl with the squash. 5. Also meanwhile, simmer the lentils: Slice remaining onion in half lengthwise and pull off the peel. Combine lentils with 1 onion half, the celery, carrot, and 1 bay leaf. Add water to cover by 1 inch. Bring to a boil, add the salt, and then cover and reduce to simmer until lentils are completely tender, 15 to 20 minutes. Pick out the vegetables and bay leaf, strain out excess liquid, and then add the lentils to the bowl with the squash and onions. 6. Cook lasagna noodles: Bring a pot of water to boil. Add kosher salt, and then cook the lasagna noodles until al dente, about 8 minutes, or 1 or 2 minutes less than package instructions specify. Rinse the noodles under cold water and then drape them over a colander or spread them out on a baking sheet so that they don’t stick together. 7. 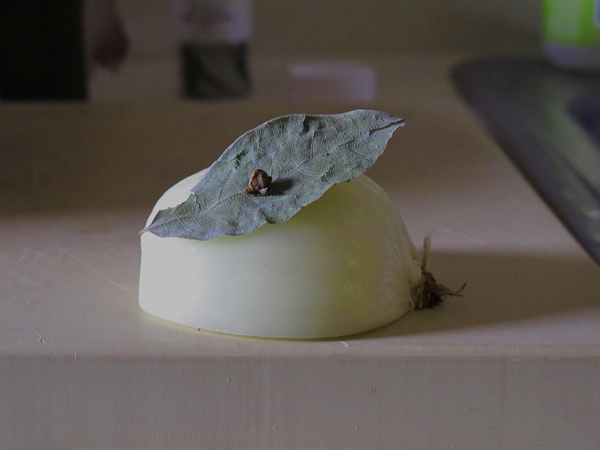 Prepare the béchamel: Poke the bay leaf with the clove and then attach it to the remaining onion half (this is called a “piquet”). Combine the piquet with the milk in a medium sauce pan. Simmer, stirring periodically, for 15 to 20 minutes. Fish out the onion and then strain the milk through a sieve into a large liquid measuring cup. 8. Make the béchamel: In a large, heavy-bottomed saucepan or Dutch oven, melt the butter over medium-low heat. When foaming subsides, sprinkle the flour over the butter and whisk constantly for 2 to 3 minutes (this is a “roux”), until it just starts to smell nutty and has turned a shade darker. Working in increments, pour in the milk, whisking constantly so as to break up any clumps of flour. Simmer, stirring frequently, until the béchamel is the consistency of glue, which will take about 10 minutes from when you’ve begun whisking in the milk. Stir in the nutmeg, remaining 1/2 teaspoon salt, and a few grinds of pepper. 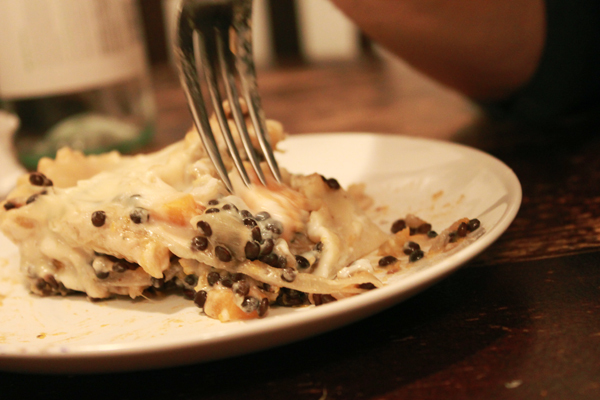 Pour half the béchamel into the mixing bowl with the vegetables and lentils and fold with a spatula to combine. Taste, and adjust seasonings if necessary. 9. 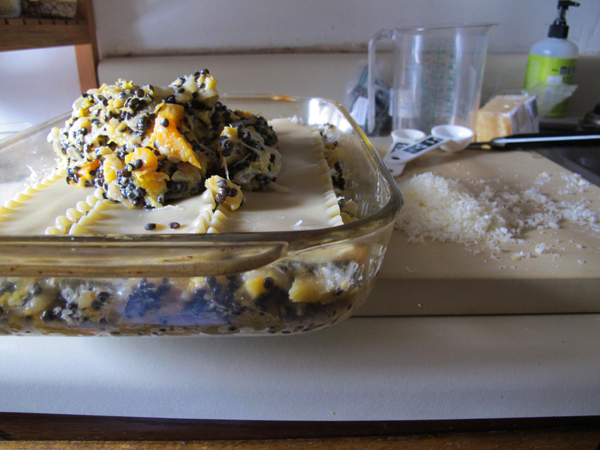 Assemble the lasagna: Spread one third of the lentil-squash mixture in the bottom of a 9 x 13 baking pan. Sprinkle 1/4 cup parmesan cheese over it, then cover with 3 lasagna noodles. Repeat layers twice. Pour remaining béchamel over the top, spreading with a spatula to cover completely. Sprinkle remaining 1/4 cup parmesan over. 10. Bake: for 30 to 40 minutes, until bubbling at the edges, the top is golden brown, and a sharp knife inserted in the center comes out hot to the touch. Let rest for 10 or 20 minutes before eating. This lasagna can be prepared up to 1 day in advance, wrapped tightly, and kept in the refrigerator. 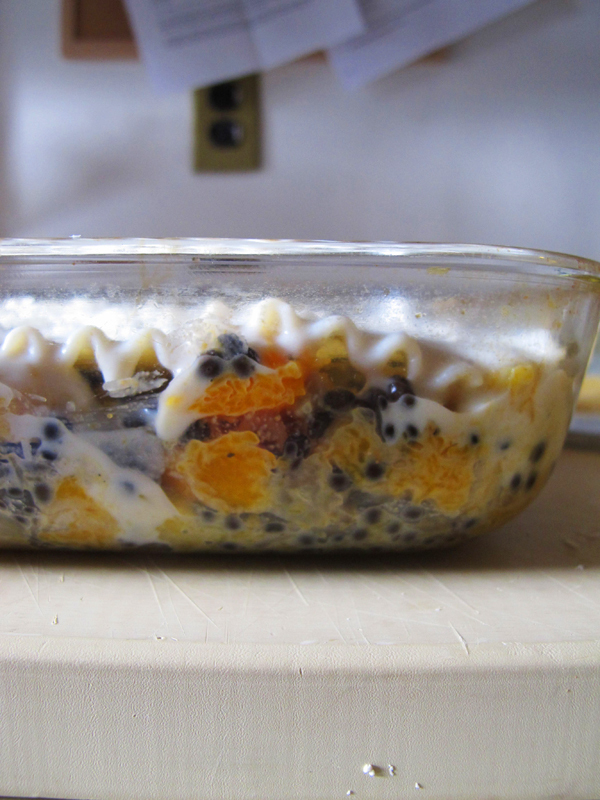 Before baking, let sit at room temperature for an hour. Leftovers will keep for 2 or 3 days in the refrigerator, wrapped tightly, or for up to a month in the freezer, wrapped tightly and kept in an airtight container. Wow, sounds like a great combination! Beautiful post 🙂 I wonder if there is a way to put the lasagna noodles in uncooked and let them cook in the dish. There would have to be some extra liquid in the mix. I will have to try your recipe in any case. My most yummy experience making carmelized onions was for French onion soup once. It was like classic “slow food” before slow food became new chic. I’d cooked the roasted turkey bones and skin overnight even, in a large stock pot (bad bad me, unattended pot). The only problem with this soup was the, um, emissions. Apparently my digestive fauna really enjoyed it too. But it was too good to resist! That would help, to figure out a way to use uncooked noodles. One less pot to clean! The lasagna noodle box had a recipe for not cooking the noodles first for a lasagna, which was what gave me the courage to actually try it. I think instead of adding another half cup of milk to the sauce, I might next time try adding a cup of the lentil stock to the sauce, because it wasn’t soggy at all, maybe another reason the pasta didn’t cook as much as I wanted. It is probably just easiest to cook the noodles first in general, and there are so many pots, what’s one more, that isn’t even hard to clean. Thanks so much for sharing your test kitchen results! That is so helpful to know. I’ve only tried the no-bake noodles once or twice, and I feel like they’re best in tomato-based lasagnas. But hopefully the noodles will have soaked up some juice in time to eat the rest as leftovers. I’ve found if you fill a bowl with hot tap water and a bit of salt and throw the lasagna noodles into it and let them sit while you pull together the other ingredients, they’ll soften enough to assemble into your pile o’ stuff and cook up beautifully without having to add additional liquid. Thanks so much! I’ve never heard of this tip before. Ooooh that looks fantastic. That was EXACTLY what I was looking for. Thanks, you’re a holiday meal superhero!